Hi bass lovers! 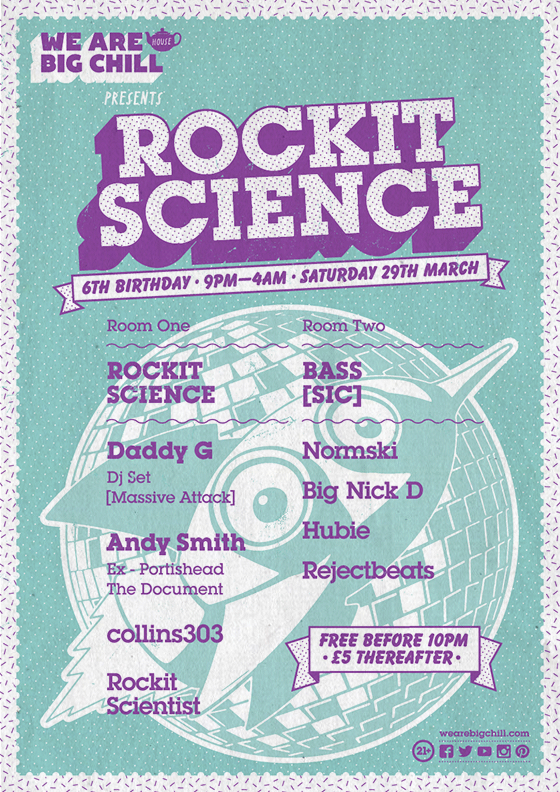 We’re back for 2014 with some exciting news… we’re proud to announce that we’ll be hosting the second room at the mighty Rockit Science 6th Birthday Party on Saturday 29th March at the opulent Big Chill House in King’s Cross. There will be some proper British musical royalty spinning on the ones and twos at this party, with Massive Attack‘s Daddy G, Andy Smith (ex-Portishead) and the one and only Normski headlining the event. In support we have the ever reliable collins303, Rockit Scientist, Big Nick D, Hubie and rejectbeats banging out quality disco, house, electro and loads more for your lovely ears. Entry is FREE before 10pm and only a fiver afterwards. Make sure you get down nice and early to reserve your place on the dance floor, because this party is gonna be HUGE! We hope you’ve more or less recovered from the weekend! We’d just like to make a big shout out to everyone who came down to The Cornershop on Saturday night and helped make our second ever Bass[sic] such a raving success! Extra special big ups to Plaza de Funk, Collins303 & DJ Ryu for their excellent sets and of course to the resident DJs too! We’ve updated the Gallery page with all the pics from the party so make sure you check them out! Just a quick reminder that Bass[sic] is taking place this Saturday 28th January at The Cornershop in Shoreditch! We hope you can join us for what is going to be a cracking party chock full of banging beats and bouncy basslines! And make sure you check out this week’s Hubie Sounds Bass[sic] Special with a guest mix by club residents rejectbeats to get you in the mood for the party! Due to The Cornershop making a temporary booking mixup, this Saturday Bass[sic] will be taking place upstairs in the bar on street level and not downstairs in the basement. But don’t worry, the music will be banging, the guest DJ lineup is still the same and of course entry is still FREE all night long! We recommend you get down nice and early to ensure entry because with a temporarily reduced capacity the venue is bound to be rammed early doors! We look forward to seeing you! After the mahoossive success of our maiden voyage back in November, we’re mega excited to announce the second Bass[sic] party, taking place on Saturday January 28th 2012, once again at the lovely Cornershop in Shoreditch, London! Come and celebrate the first payday of the year and banish those wintery January blues at Bass[sic]! * FREE ENTRY ALL NIGHT! * PLAZA DE FUNK [GROUND LEVEL] – Plaza De Funk has been a staple in the dance community for at least the past 5yrs & it looks like nothing will slow his way to the top of the music world. Since moving to London in ’05, he has released award-winning records receiving huge support from the likes of Fatboy Slim, Elite Force, Plump DJs, Rico Tubbs, Black Noise & many more. After winning a Breakspoll Award for his sublime DJ skills a few years ago, Mr Funk has played clubs & festivals around the world & back again stopping off in Australia, the US, China, Russia, Latvia, Belarus, endless dates across Europe & of course back home in the UK at Glastonbury, Glade, Chew The Fat!, Fabric & Ministry of Sound. Catch the man in action for free at this months Bass[sic] or miss out, it’s up to you. * COLLINS 303 & RYU [Rockit Science] – Here at Bass[sic] HQ we’re very excited about our next guests. Camden party legends Collins 303 and Ryu have been putting on raves called Rockit Science for over five years now. Their infectious blend of Disco, Funk, Balearic House, Big Beat, Breakbeats and Electro will ensure the second Bass[sic] will go off with a bang! We really hope you can join us for this second party and help us make it even bigger than the last one! If you’re weren’t at the last one, make sure you check out this video to give you an idea of what to expect. Boom!